The following is a paid review and is completely of my own opinion and is not influenced by being paid. If you’re interested in having me review your site or product, you can purchase a review from me through PayPerPost by clicking on the PayPerPost Direct button located at the top left of my blog. This is the first of a two-post series review of Entrecard.com. In this review I hope to introduce Entrecard and explain it’s features. Then in one week from now, after running Entrecard on my blog for a full week, I will be posting a follow-up review which will show the results and effects in regards to traffic. Launched only a few weeks ago at BlogWorld, Entrecard is the work of successful Internet entrepreneur Graham Langdon – the creator of the Million Dollar Wiki. In short, Entrecard.com is a free advertising exchange network catered to the blog community. 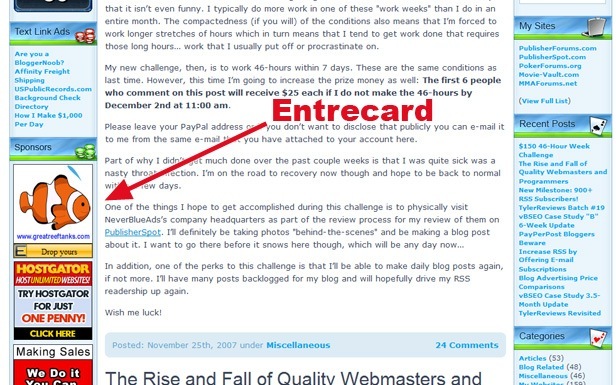 Before I continue, it is important to note that Entrecard is being noticed and used by the top bloggers and marketers, including Joel Comm, John Chow, Shoemoney, and soon Problogger.com. Through the use of virtual business cards which are actually 125×125 buttons, Entrecard works by effectively letting Entrecard users trade business cards with each other, which is referred to as dropping. For each card that is dropped, whether it be received or sent, one credit is generated to both the receiver and sender. 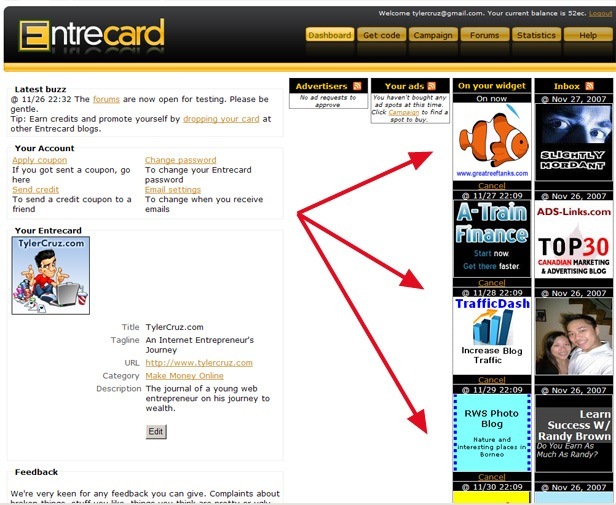 These credits can then be used to purchase ad space on any of the blogs within the Entrecard directory. Signing up is fast and easy, only requiring that you own and operate a blog. Once logged in, you supply some basic details about your site and upload a 125×125 button. If you do not have a 125×125 button you can use Entrecard’s built-in 125×125 HTML generator tool which will create a custom ad for you, although it’s definitely encouraged to have your own banner for better conversions. The goldfish image is an advertisement from another blog which purchased the slot on my blog by trading in credits, which will be explained shortly. The small orange "Drop yours" button is for other Entrecard users to click on and drop their card to me. Now, this process can be quite confusing, but once you sign up and start using Entrecard it all becomes very clear. Entrecard uses a credit system, which currently has no monetary value (although users might be able to cash these points in for real money in the future). What good are credits for if you can’t cash them in, you ask? Well, you spend them by purchasing ads on other blogs – hence Entrecard being a blog advertising exchange network. This is done simply by an Entrecard member visiting your blog and clicking the "Drop yours" button on your Entrecard widget. You receive 1 credit as a result, and the member can only drop one card to you per day. This is the exact inverse of above; whenever you visit another blog which has the Entrecard widget and you drop your card, you receive 1 credit. And again, you can only drop your card on their blog once per day. When somebody purchases the 125×125 space available in your Entrecard widget, you receive points. The amount of points depends on how much your current price is. This number is determined by the number of card drops your blog receives over a 5-day-period, divided by 5, resulting in the average number of drops over the past 5 days. There is a maximum of 10-advertising spots any Entrecard user can have. This was done to give everyone a fair chance to advertise on blogs. I’ve only been using Entrecard for a day and all my slots have been constantly sold out at 10 already as seen below. The screenshot below also shows the order, time, and date that the advertiser’s cards are scheduled to display on my blog. Each advertiser gets their 125×125 card displayed for one entire day. So how and why is Entrecard useful? Simple… First, Entrecard lets bloggers who may not be able to normally afford to advertise on large blogs such as John Chow and Problogger, to do so. By simply visiting the various blogs in the directory and dropping cards, and/or getting other Entrecard users to drop their card on your blog, even the smallest bloggers can earn credits regardless of how much traffic they receive. As of the writing of this review, the current price to advertise on my blog with a 125×125 banner for a full 24-hours is only 14 credits. 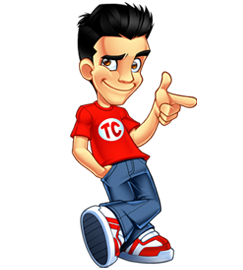 14 credits can be achieved by visiting 14 blogs in the directory and clicking on their widget, which would take approximately 2-minutes. This is how you can get free advertising on even the largest blogs. For example, currently John Chow costs 53 credits per day. If you saved up 530 credits, which isn’t that hard to do, you could effectively book your 125×125 banner on his blog for 10-days. Considering John charges $500 a month for a 125×125 banner on his site, the value of a 10-day Entrecard ad would be equivalent to $166. If you look at things that way, in that instance 1 credit is worth $0.30, which is quite amazing considering you can literally earn 1 credit every 10-seconds by just actively dropping your card on other Entrecard blogs. And with other big blogs such as Problogger joining Entrecard soon, there will be plenty of opportunities to advertise on the top blogs. I’ll be back in a week to post the results of having used Entrecard myself for a week, and give a breakdown in the traffic I received, so stay tuned. I’d personally recommend Entrecard for any blogger that can’t afford to pay for advertising, but wants the opportunity to advertise on blogs large or small, for free. Oh, and if you sign up, be sure to drop your card on my blog each day to earn us both credits! Its not bad as it brings in some visitors to your site my only complaint with it, however, is that typically users that are coming from Entrecard are there only to drop their card and then they are gone which is entirely pointless traffic if you ask me. However, adding the entrecard in a place that detracts from the visibility of the 125×125 pixel spots that you already sold based on their former visibility is pretty lame. Sounds, interesting, but as Lauren says, it doesn’t brings real traffic to your blog! I’d agree that some people are just coming to your blog to drop a card off, but I tend to have a scan around and see if there is anything interesting to read on the blog if I haven’t been there before. I don’t tend to comment just for the sake of it, but take time to see if it’s worth a quick read and a return. For me my RSS shot up from visits from Entrecard visitors, even though my blog is still in its ‘starting’ stage. 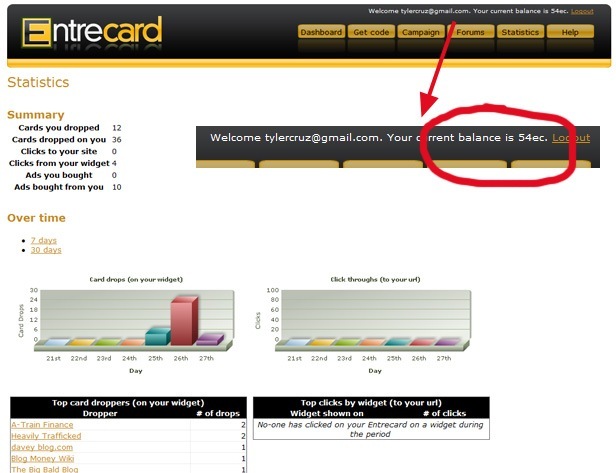 My first though when reviewing Entrecard was that the traffic being received from other Entrecard users going to your site simply to drop their card was essentially worthless, but there are two important things to note here. First, as Graham pointed out to me and Nick just posted, while this is true for most of the users, some of these users will inevitably stick around and read the blog and possibly become a new repeat visitor. I know that when I visited other blogs in the Entrecard network that I at least took a quick look around their blog to see what it was all about. Secondly, this traffic is only from “card droppers” – it should not be confused with traffic you receive when purchasing ads on other blogs! This, I’m sure you’ll agree, can be labelled as quality traffic. The “card dropper” traffic is simply a bonus. Entrecard is awesome! I am stocked about this! I think in the long run, it will payoff. I think it’s success will largely depend on how the credits economy is handled. They may even have to fix some of the numbers, because I think it can get out of control, and over-inflated, etc. Here is another point to add on top of Tyler’s comments. 1) Lets say, 100 users drop cards on your website, Even if the traffic is from card droppers, it increases your unique visitors. Isn’t that worth something? I think so. I went to drop my card over at Shoemoney, however I noticed he doesn’t have it anymore??? I then went into the entrecard website, logged in, but could not find him on there either. Do you think he dropped the program? Yes he removed it, but ProBlogger just added it, and it’s only 9 credits to get an ad on his site right now, lol. I submitted to his blog when it was at 2 credits, but it has been pending since the morning, I doubt it will be accepted. Just starting with Entrecard. You have great instructions here on how to maximize the use of the card.